On August 27th, my band, Sorry I'm Dead, was supposed to play a matinee show at a place called Dreamhouse. I didn't know much about the show and had never been to that place before. I knew we were playing with Maenads, who I liked, and with another band that had been described as "pop-punk", a term that makes me frown a bit. It would probably be fun anyway. The show got delayed. We were scheduled to be there at 5pm instead of 2pm, because of some confusion about when the touring band was told the show was starting. It wasn't a big deal, but I had been excited to play an early show. I should mention that we also did not know where the venue was and did not get a lot of info from anybody. This show was not the most organized event. It was probably still going to be fun anyway, right? Okay, so we get to the venue. Now we have to cross a busy street and walk up approximately 1,987,464 stairs and then back down 5,491 more into a basement to get our gear loaded in. It was a pain, especially with Dan's cab. We were the first band there, and the person who booked it wasn't gonna be there. It was still gonna be a fun show though, right? A bunch of people got there soon. I messaged some people, posted about the show on Facebook, and went to my friend's house that is only down the street from the venue. Here's where I screwed up - I was late to get back, and we were first. Our set went over well. We all made some mistakes. Some of it was because the way the room was set up. It was hard to hear everybody else; Laura and I both had trouble hearing Dan's bass. I'm sure the vocals were not the most audible either for my bandmates since there were no monitors. Our set was still pretty good, and it was fun to do. The audience was really into the stuff we played and asked if Sorry I'm Dead had anything to buy. Unfortunately, we only have a live album on Bandcamp, maybe uploading that to Spotify and the like soon, and now we also have an EP in the works. We've been talking about this EP, formerly an album, for a few months now, and now we are finally doing it. We already have the songs recorded, so it shouldn't be too hard to get it done. Shameover finally got there right when the next band, Maenads, was setting up. They had a long drive from Chicago. Shameover was concerned about a creepy sound from the trees, which was just the sound of cicadas. After doing some research, I found out that periodical cicadas, the ones that live in the underworld for 13 or 17 years and recently emerged like the souls of the dead, are focused here in the eastern United States, so I guess they don't have those in Vancouver where Shameover is from. 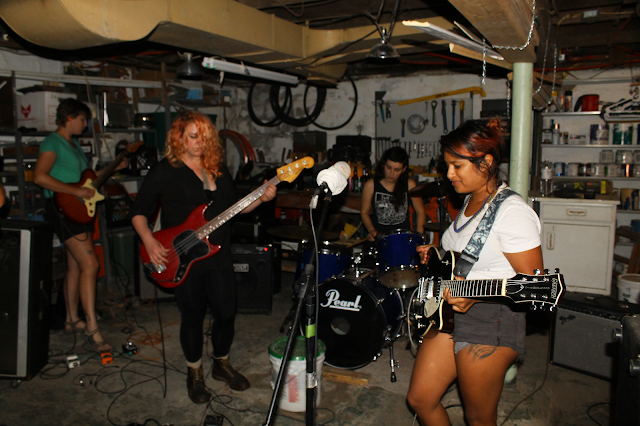 Maenads played a great set! They have some new equipment, it seems; the guitars sounded louder and the band sounded fuller overall! Everything was really tight, with cool, sludgy songs of doom and gloom mostly; there are some really cool spacey leads! Maenads sounds like Mars Red Sky, Causa Sui, and Yuri Gagarin. 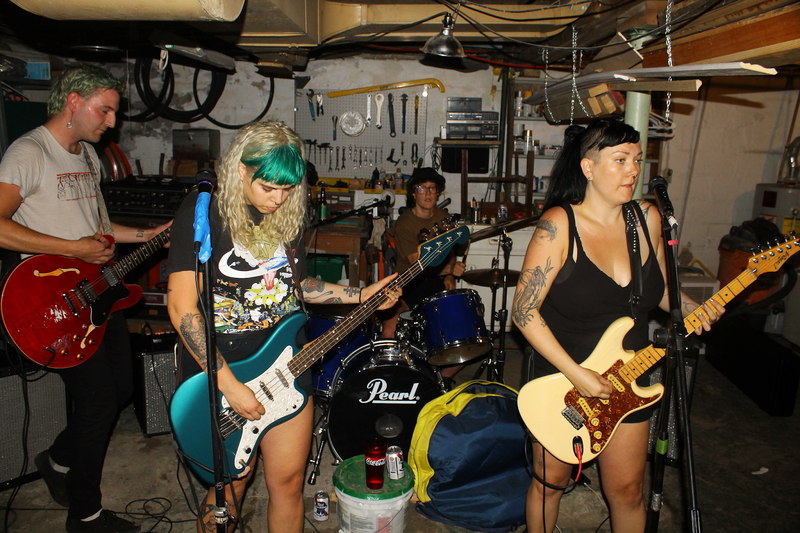 There's also another newer sludgy, stoner band that I can't think of that I think of every time I see Maenads; I can never remember the name of the band though. I hope they put out a cool release soon too. Finally, Shameover set up. I was prepared for the worst since I usually hate when people describe things as pop-punk. This was great though! It was more like the Ramones, the Descendants, or ancient Pittsburgh punkers Da Shunts, not like Blink-182 or Fallout Boy with those sing-song vocals. That sounds goofy, considering I'm talking about people literally singing songs, but I want more of a growl and less of a total match pitch for pitch. That 2000s pop-punk stuff hurts my ears; it's too polished! Shameover was very poppy, with vocal harmonies, nice guitar interplay, a hearty bass sound, and thumpy drums with unique beats. The songs were well written and the vocals were on point; they weren't rough and out of tune, and they weren't too perfect either. This is how I want pop-punk to be. It was actually a fun show! We still had to load all the gear out, up and down the stairs, and dodge cars, afterwards, but I went home feeling really positive. The bands were all super good; I bought a tape and t-shirt from Shameover, who were really cool peeps. I'll be reviewing the tape next time, and I hope to see you here for that!